If you’re looking to stream high-quality content online, then hands-down Mobdro is the perfect choice for you. Mondro is a highly versatile app via which you can stream movies, videos, podcasts, Live News and other favorite Channels/Videos online for free of charge just like Showbox APK and Cloud TV. The app allows you to discover, capture and also share various online streams and also it makes it available for offline viewing, so you never miss any TV shows. 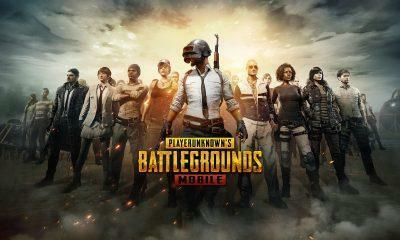 All the popular and latest movies, web-series and other famous channels are available on the Mobdro APK. To start enjoying the world of Free media content, just Download the Mobdro app on your Android Phone and install the latest version of Mobdro APK file. Mobdro’s new user interface is quite intuitive to use and navigating around the app to discover new Live streaming content is as easy as it gets. When you first open the app, the top section is where all your recently watched content will be presented to you, in a sliding slide-show fashion. Animals: Wild-life related content is streamed here. However, a better list of wildlife can be discovered under Channels section where streams from Nat Geo and similar channels are available. Moreover, under each of this section, you get to filter out the content by languages and also sort the content Alphabetically, to enable this options, just tap on the Eye symbol on the top-right corner, and start selecting from all the popular languages. Furthermore, you can even set a permanent filter for each category so that every time you enter it, the filters are auto-applied. And the content that isn’t in your preferred language will be discarded. This feature allows you to bookmark specific streams that you wish to visit again in future; the Bookmarks section can be accessed by, Swiping from the left side or you can also Tap on the hamburger menu(Three lines aligned vertically), to reveal bookmarks section, where you will find all you marked content. If you by chance lost the stream that you were viewing a few seconds ago and can’t find it then calm down, Mobdro offers you to inspect the Recently View Content. It is present just at the Home-page, so get back to the homepage and start sliding from left to right and you shall see the last viewed stream/content in that recently viewed area. The Parental filters can be enabled by heading over to the side menu and then tap on Settings and scroll down. Now you should see the Parental filters option Tap on it. And Mobdro will limit all the inappropriate content restricted to the under-aged audience. 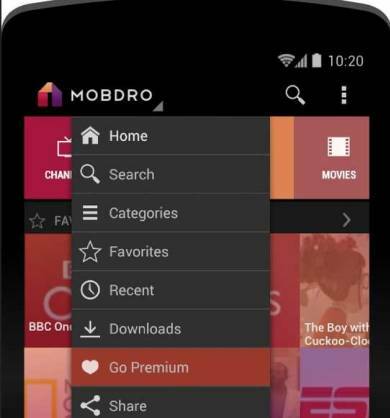 Mobdro also allows you to Download anything that fancy’s you. To download it, just head over to the recently watched area, which is the first thing that you see on the homepage. Once, you find the content that you want to download, just Tap on the three dots and Select the Download option. You can also Queue multiple downloads at a time. And to view them, swipe from the left to reveal the side-menu and within that select the Download option. Mobdro also offers the ability to share content on the go and various platforms as well. The Sharing option can be found when you’re in within the video player of the app playing content, and on the top right corner, you can find the sharing icon. Most of the features are also available on the FREE version of Mobdro APK. Ad-Free Experience: However, just like Tutuapp the Free version has ads within the app, which gets removed from the Premium version. Unlimited Downloads: Furthermore, now your Download streams ability is also increased to endless streams, while on the Free version it is limited to a generous number. Sleeper Timer: This is a great feature that permits the user to set a specific time after which the stream will end and it turns it off — a perfect option for users who like to stream at mid-night and might fall asleep in the middle of the stream. However, we already covered how to get such things done in Mobdro APK when you want to get a trail of some premium features or have an ad-free experience by using the Lucky Patcher app, which helps in performing such things. 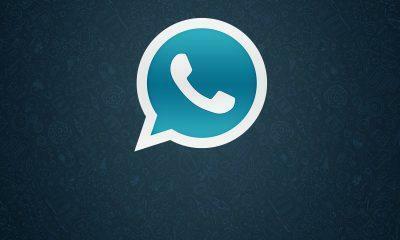 Good to hear that this app is free to download and use. thanks!